In basketball, some teams have an enforcer, a tough guy who does the dirty work. 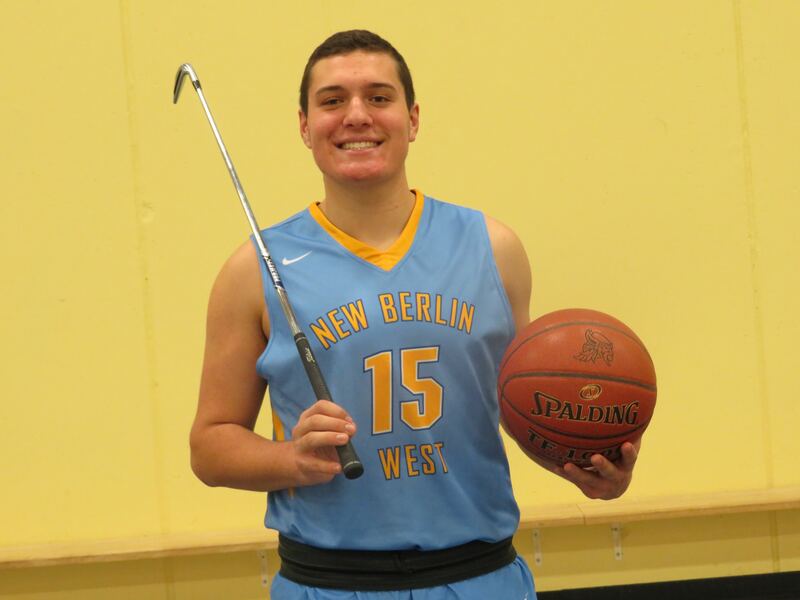 For New Berlin West, senior Hunter Pipik plays that role. Pipik, a 6-foot, 3 inch, 220-pound forward, is wrapping up his third season on the varsity for Coach Brandon Mattox. Off the court he brings leadership to a young team. On the court, you will find him in the paint, boxing out and getting rebounds for his teammates, while also guarding the opponent's best scorer. 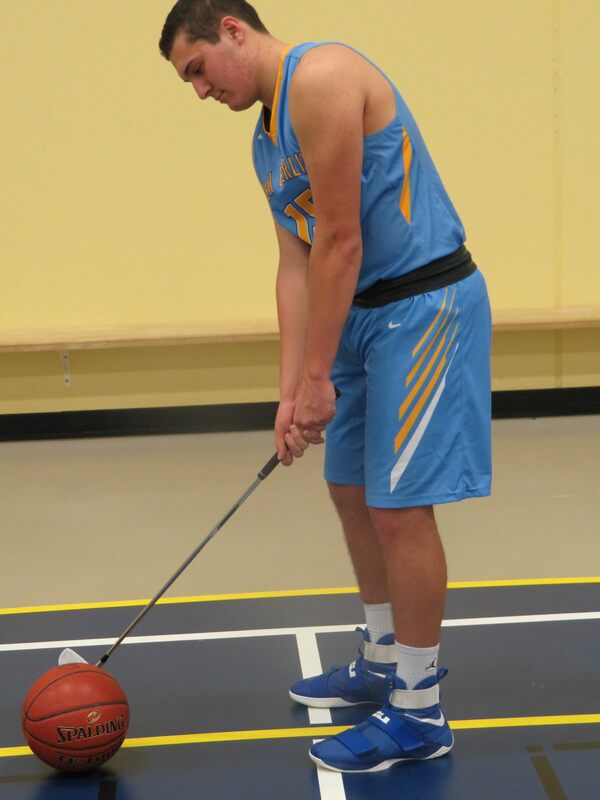 In the spring, Pipik turns in his basketball for a golf club for the Vikings and is one of the better golfers in the league. In fact he received a scholarship to play golf at Division 2 Lewis University next year. It's not surprising that Pipik is so talented in golf, since his family lived on a golf course in when they lived Edgerton. "It was right in my backyard," Hunter said. "I got to do it whenever I wanted. That really became a passion for me. Every summer, every day with my brother Drew (currently a junior at Carthage College). It has been our passion ever since." Pipik was quick to compare golf to basketball. "Golf is an individual sport, so you're by yourself. It's more of a mental thing," he said. "It's your fault (or credit) no matter what. And it's something you can play for a lifetime. "In golf you forget about that last shot and move on to the next. In basketball it's actually kind of similar there, but there is so much more than that goes into basketball; so much more game-time adjustments that you have to take into account. So many different variables." Pipik made it to sectionals as a sophomore and a junior. He has his sights set on state this spring. Hunter is one of three players to play every game through the first 19 games. He is first in total points (10.6 points per game) and rebounds (7.6), shoots over .500 from the field and is third on the team in 3-pointers and steals. Pipik has 28 more defensive rebounds than his next closest teammate and he brings a toughness to the Vikings. "My rebounding is a strength and I've developed a better shot in the last season and a half or so. I think that helps us improve," he said. "I'm more of a defensive rebounder. I go in for offensive boards, but I like to work on the defensive end - getting position. That's what I really excel at. I'm not a big guy so I can't really jump over anybody. But when I get in position it's tough to get around me." But Hunter would like to improve his quickness and his ball handling. "I need to get quicker with my feet because I'm a little undersized for a post player," he said. "I need to improve my dribble because if I work on my handles, I will be able to play on the perimeter even more." Pipik knows what his role is on this club. "I'm the guy who can bring the aspect of toughness and physical presence and make sure the other team knows that they're not going to get it easy," he said. "As well as knocking down a few key shots when my number is called upon." Mattox talked about Pipik's attitude and how he knows what he can and can't do. "First of all, his intensity. He isn't scared of anybody," he said. "He matched up with Alou Dillon (of Wauwatosa West) - Alou probably has 6-7 inches on him - but Hunter is going to work. So he is going to make it tough on Alou. It's just that competitive nature that he has, his personality and his leadership. "He's not the most overly-skilled basketball player, but he will be the hardest worker. He knows how to uses his skill set to be effective. Which I think makes him a very effective basketball player. He doesn't try to do things which are not in his wheelhouse. He stays with what he knows and what can work for him." Mattox remembers when he first met Hunter at an open gym his sophomore year. "It was the summer of my first year here. He walked in the open gym, a broad shoulder kid, solid," he said. "He explained to me they were moving to West (from Edgerton). I met his dad (Gary) that day. I was excited for him to be here." Mattox talked about his first impression of Hunter - off as well as on the court. "I didn't know what kind of player he was, but he was the kind of kid who would shake you hand and look you in the eyes, very respectful," he said. "I was excited about that." "Not to toot his horn too much, but he's probably one of the hardest working kids on the west side," Mattox said. "From point A to point B to where he is now. I'll put that up against anybody. The thing I was most impressed with right away was his work ethic. He's a kid who consistently puts the work in, so to see him progress over that sophomore year and then realize we needed his physicality on the glass, he constantly got better and better. He literally got to the point that I had to play him. In practice it was so obvious he was a hard-working kid, we had to reward that." Pipik first started playing basketball as a first-grader playing on a short-handed fourth-grade team coached by his father. "I liked the contact," he said about why he stayed with basketball. "I liked how you can be physical, but you didn't need any protective gear. I feel I bring a little physicality. That's what I've always gone for." Pipik and Zach White, captains the past two years, and Joe Robey, a junior, were voted this year's captains. As much as he provides on the basketball court, Hunter adds even more off it. When asked what he felt his major strength was he had an interesting answer. "Besides bringing the thing of toughness to the table, my leadership," he said. "I think that's really important. We as a team need that to an extent. I like to lead by example. I also like to lead with words, but I do it better when I'm out on the court demonstrating what I want done as a captain and a leader." Pipik also talked about his communication skills when he comes to help out his teammates. "I handle them differently because their personalities are all different. I try to help the younger guys on our team, especially (point guard) Desmond (Polk). He's a freshman, he's an outstanding talent. I try to help him the best I can." Mattox spoke about versatility when asked about Hunter's leadership skills. "He's like a golfer - a jack of all trades - he can chip, he can putt and he can drive the ball. He can do it in a variety of ways," he said. "That's something we talked about earlier in the year. Knowing which guys you can get on verbally. Which guys you need to pick up. He's amazing with that as far as that. "He's a natural leader as far as guys gravitating towards him. He's very aggressive so initially as a sophomore he was barking at these guys and some of the guys didn't know how to take that. He would say 'Hey coach, he's not working hard.' And he (the player) wasn't working hard. So we would say 'What are we going to do. So he has changed his approach and a lot of that is just maturity on him. "He'll think 'I want to win and I want to do X, Y, Z. So when I'm working with this guy, how can I change it. It's working with this guy, so I going to maintain it.' That's a big thing with him." Pipik talked about how Mattox's is message is starting to get through to his team since Hunter first got here as a sophomore. "It seems more like a family this year - I know that sounds like a cliché - but it really does," Pipik said. "We all like each other. The rebuilding process, he (Mattox) has a lot of plans for what he wants to do - we have a lot of future coming up - we're just trying to get the ship righted for them coming. "He's definitely a people-person. He knows how to handle people. He knows what they're thinking and he knows how to treat them. I think that's really important and a good quality that he has." Mattox talked about his seniors who have been with him and how much they mean to the program. "He (Pipik) is part of that senior group that came in when I came in. I'm very connected with that group - Matt Obradovich, Fred Cottrell, Zach White. That group is very special to me long term career-wise. I will always be in their lives whether they like it or not. "Hunter is part of that leadership group - we talk constantly about changing the culture here at West, he's a big piece of that for us." FAVORITE TV SHOW: Two and One-Half Men. WHAT DO YOU DO TO RELAX? Play Xbox with friends, quality family time. MOST MEMORABLE SPORTS MOMENT: Hole-in-One in a tournament junior year at Lawsonia. WHAT WOULD YOU LIKE TO DO IN THE FUTURE? Attend Lewis University and play Division 2 golf. Major in Business Management.